Insight Bureau: The 14-ft long statue of Lord Vishnu, which is made from a single stone, is floating in water for the last 1,300 years. The scientists have not been able to crack the mystery yet although they claim that it could be a silica based stone but with remarkably low density similar to lava rock. The statue is located at Budhanilkanha Temple, located in Shivapuri Hill – 9 km from Kathmandu, Nepal. And, it has been a big tourist spot for decades. 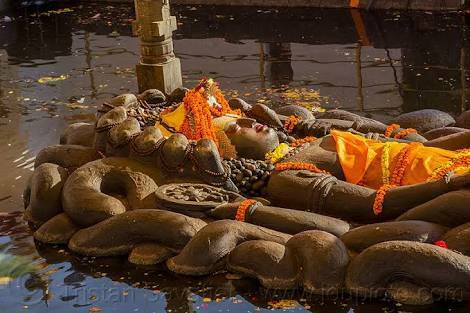 Devotees consider it a miracle that a statue made of stone is floating in water for centuries. Budhanilkanha Temple is also known as Narayanthan Temple. The main statue is a black stone structure carved from a single rock oof black basalt. It stands 5 meters tall and placed in the middle of a pool of water. The statue represents ‘Anantashayan’ mudra of Lord Vishnu.